It appears that things are calming down a bit for Pinterest in the last few months. It seems that the social pinboard’s tremendous growth have finally stabilized and recently there were even few reports indicating that it is actually losing users. I already reported at the beginning of last month that Pinterest growth is probably slowing down. Now, I’ve decided to dig in deeper and examine what is the current state of Pinterest. For that, I have collected data from all kind of sources to try portraying the best picture as possible. 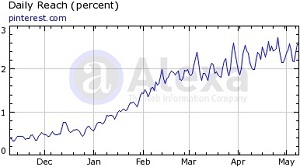 One of my favorite tools to examine websites’ trending is Alexa. Yes, I’m aware of its limitations and (very) possible inaccuracies. However, despite all of its disadvantages, Alexa still show nicely online trends even if they aren’t perfectly precise. One of the most popular platforms for Pinterest is Facebook. The Facebook app of Pinterest is widely adopted by many users and therefore it’s also a good place to examine how it is performing. AppData offers relatively accurate information for this purpose. Well, AppData’s Pinterest page is actually indicating that Pinterest number of daily active users is booming for a record of nearly 3 million, triple as much as the beginning of April! As for monthly active users, it looks like that there is a decrease from over 12 million in March sown to more than 10 million today. Shareaholic publish every month a report of the biggest traffic sources online according to its network of more than 200,000 publishers. On the latest report for April it shows that for the second consecutive month, Pinterest is sending less visitors to other sites. While couple of months ago it sent more traffic to other sites than Twitter, now things back to the way they were. 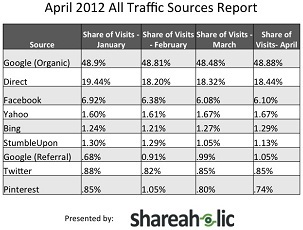 On February Pinterest was responsible for 1.05% of the sites’ traffic and on April it was responsible for only 0.74% of the sites’ traffic. On a guest post on VentureBeat, Jeffrey Zwelling from Convertro disclosed that in the first quarter of 2012 Pinterest was responsible for a record of 17.4% of the company’s 40 eCommerce clients revenue. This is almost double from the quarter before. Note that he doesn’t mentions visitors from Pinterest, just revenue. It could mean that either Pinterest is sending more traffic for the eCommerce sites or either that visitors that arrive from Pinterest simply spend more money. Visitors from Pinterest spend an average of $180 compared to only an average of $85 of visitors from Facebook. Visitors from Pinterest are much less engaged than visitors from Facebook. It doesn’t look like that Pinterest is losing users, but it probably also isn’t gaining many new ones. In other words, user growth has declined drastically. Visitors from Pinterest to retail and eCommerce sites demonstrates an increasing-spending behavior pattern. The reason for both of these conclusions might lay in Pinterest recent months effort to battle with spammers and particularly with affiliate spammers. 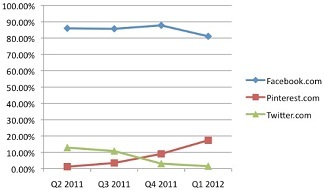 That might explain the decrease in user growth as Pinterest attracted until then many spammers. With the reduction of spam pins which links to low-quality sites, Pinterest users are being exposed to more reputable and quality sites which leads to an increase of their spending behavior.